Sunday 30th November 2008. 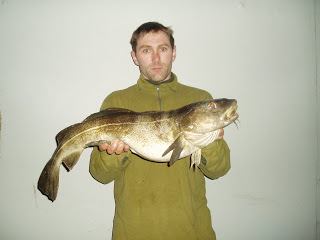 Rob with his fish of 12 lb 01 1/2 oz A high water ebb match decent swell in the water saw another double to the scales. This time it was Rob Allison with a fish of 12 lb 01 1/2 oz beating Bernard to take the heaviest fish of the season title so far.It was part of a bag weighing in at 25 lb 01 oz. Wednesday 26th November 2008. A low water match with alight swell in the water.B.Vasey won his first match of the season with two fish for 13 lb 01 oz including a double of 11 lb 00 oz the heaviest of the season so far. 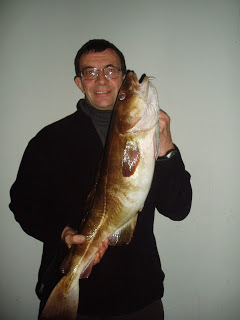 Bernard with his fish of 11 lb 00 oz. 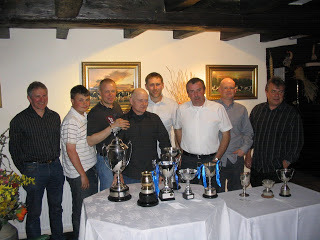 This Years Whitby Sea Anglers Trophy Winners 2008-9 Trophy Results 1) R.Allison 202-11(86) 2)D.Thompson 176-13 (83) 3)B.Harland 152-5 (103) 4) C.Stainthorpe 75 -0 (51) 5) D.Perrett 73-0 (56) 6)B.Laws 71-9 (48) 7) P.Mead 52-9 (26) 8) M.Vasey 46-6 (35)Heaviest fish : R.Allison 12lb-1.5oz. Heaviest bag: D.Thompson 28-14 (7). Heaviest fish outside a match: B.Harland 8lb-10 oz. Greatest number of fish: B.Harland 103. Christmas match winner: C.Stainthorpe 5lb-13oz (7) Singles match winner:D.Thompson,runner up: P.Mead. 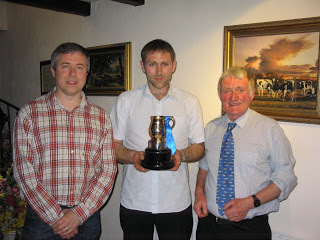 Doubles match winners: C.Stainthorpe,J.Gilpen, runners up: D.Thompson,R.vasey. Junior winner: R.Vasey. Junior heaviest bag: R.vasey 3lb-9oz (1). Junior heaviest fish: R.Vasey 3lb-9oz..
Martin Greaves of Whitby Angling Supplies,This years winner R.Allison,Chairman W.Atkinson.